I am so obsessed with Margartias lately. Maybe it was the burst of warm weather we had in early February, but I’m not even going to tell you how fast I recently went through a bottle each of Cabo Wabo and Cointreau (don’t worry, I shared!). You’ll notice my margaritas are not bright green, and that’s because there is no sign of margarita mix in this house. Fake color, fake flavor, and unnecessary calories – no thanks! The extra effort it takes to juice your own limes is definitely worth it. Cut lime in half, and cut one wedge from one of the halves. Juice the rest of the lime. Pour some Kosher salt onto a plate. Make a small cut in the lime wedge, but don’t cut through the skin. 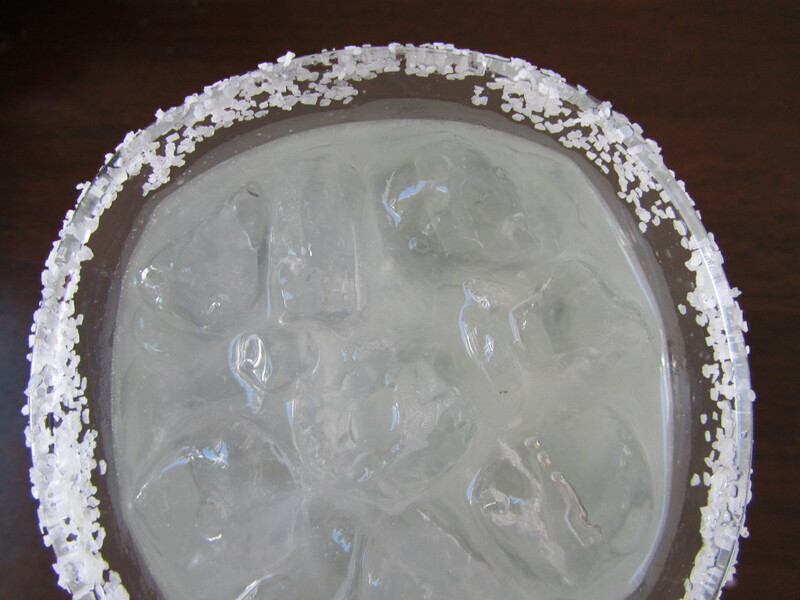 Rub the rim of your glass with the lime, and then roll the rim in the salt so that it sticks to the glass. Combine lime juice, simple syrup, tequila, Cointreau, and ice in a cocktail shaker and shake for about 15-30 seconds. Pour into prepared glass over ice. Salud! Heat one cup water and one cup sugar in a small saucepan. Stir until all sugar is dissolved. Chill before using; can be stored in the refrigerator for about two weeks. This entry was posted in cocktails, Sweet Life Laur Original and tagged cointreau, fresh, lime, margarita, salt, tequila by Laura Zolnoski. Bookmark the permalink.